This is a good color match for the sweater. 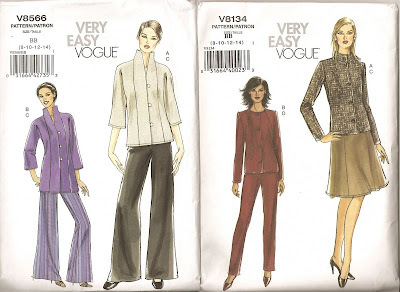 I made the jacket on the left (Vogue 8566) and the skirt on the right (Vogue 8134). I was worried that the loosely-woven cotton would not be stiff enough, so I used a firmly-woven cotton for the facing. I needn't have worried. After I interfaced the front, it wasn't going anywhere. My super high-tech method of basting the loops so they wouldn't shift while stitching. Iris grudgingly took some photos. I recently purchased this navy skirt, but it might be too short to wear to work. The funny expression on my face? That will last another year or so until the braces come off*. The fuchsia fabric needed some kind of lining. You can see right through it if the light is behind it. I had a paisley challis. Instead of making a lining, I sewed them wrong sides facing each other so that the skirt would be reversible. I made the paisley side slightly shorter. The hem is not straight. It doesn't matter because I don't like how the hem pokes stiffly out. The jacket fabric, which looked like a heavy-weight gauze, turned out to be a lot firmer than I gave it credit for. And the chevron sweater? It turned out to be a lot baggier than I had planned. I gave it to the world's greatest nanny for her birthday. She looks lovely in it. I will upload pictures later. So I made three fuchsia things and only one was a keeper. The full pattern reviews were posted on patternreview.com. My sister says that I talk too much about my health. I try not to, but I can't watch the whole health care reform debacle without putting my own two cents in. If we are going to cover health care for everyone, and I think it is a moral and practical imperative, we should also look at simple behavior changes that can reap big savings. Why are the main proponents of taking personal responsibility for our own health conservatives opposed to universal health care? I am a universal health care proponent who believes in personal responsibility. I got an unlucky genetic draw when it comes to immune systems. Yet, the first referral my internist gave me after examining my lab results and speaking to my immunologist was to a behavior psychologist who works with medical patients. I told her that I didn't need a psychologist--the tests prove that I was not crazy and the symptoms were real. She told me that I could see the psychologist or find a new primary care physician. I went. I learned an amazing amount in those sessions, and they reaped $$,$$$ of health care savings. He joked that he was used to counseling OCD people that they didn't need to be so fearful of germs. But he needed to teach me (and his patients undergoing chemotherapy) to become OCD about germs. I was already scrupulous about hand washing, but we had to extend that to others around me. Everyone who enters my office has to use the vat of alcohol-based hand sanitizer on my desk. Everyone who enters my house is directed to the powder room to wash their hands. I still don't know what to do when people proffer a hand shake. If I can't get out of it, I use the hand sanitizer I carry in my purse. I also wear a surgical mask when I fly or go into crowded places. And then there was the matter of staying up late to perform the second shift. It's been proven that immune response plummets with insufficient sleep. I just had to understand that I am not responsible for other people's messes. I shut my bedroom door and go to bed. My child can decide when she goes to sleep, because mommy has already passed out. I was told that I had the 'asthma triad' of asthma, allergies and aspirin sensitivity. No one was sure why those three went together, but they often did. (The correlation was clear, but the causality was not.) I really wasn't so sure that I had asthma. Oddly, my asthma episodes coincided with infections and joint swelling. One time, I went to an ENT (ear, nose and throat doctor) for an infection. I was miserable. I had coughed so hard, I couldn't keep food down and I was short of breath. He put a scope down my throat and said that I was coughing up stomach acid and then inhaling it. But it wasn't just this recent infection. Judging by the scar tissue, it had been going on for a long time. Didn't I often take aspirin and NSAIDs for arthritis? Did I experience asthma flare ups with arthritis flare ups? And that's not all. If you read the fine print on everything I took, they all say that more frequent infections may result from taking that drug. Well, my antibody count was so low, they were discussing whether I should start lifelong IgG infusion therapy. Read the link. It is as expensive as it sounds. * And don't forget, I already explained why I decided to forgo Enbrel or Humira, for another $1000/mo savings. I stopped taking NSAIDs and my asthma went away. I stopped taking asthma meds and I came down with fewer infections. I figure, behavior change shaved $2,000-$3,000 per month off my health care tab. My immunologist says that my immune function isn't too bad now, perhaps one in 1000 people are in the same boat. (My goal is to claw my way to one in 300 and eventually to one in 100.) That means I am at very high risk when I encounter someone infectious. There are pockets of antibiotic-resistant tuberculosis, particularly in downtown and east LA immigrant communities. I come into contact with someone with it, and I am dead. Do I care about the immigration status of infectious disease carriers? Will you care if the big one hits, disrupting LA's water supply, and a cholera pandemic breaks out? Hell, no. It is in our self interest to make health care available to all sick people, regardless of their immigration status and ability to pay. Tb, MRSA, avian or swine flu--pathogens don't care about borders and immigration status. Universal health care access is a moral imperative and in our collective self interest. Now we all just have to change our behaviors so we can afford it. Bad Dad and I saw A City of Sadness last night at the LACMA film series. The mainly Westside crowd appeared (from overheard snatches of conversation) to know a lot about film. They didn't know much about Taiwanese history. Even Bad Dad, who had heard my family's stories, still had trouble keeping the people and the plot straight. I think the problem stems from the five languages used on screen: Taiwanese, Mandarin, Shanghainese*, Japanese and Cantonese. You are supposed to learn something about a character's background, sympathies and motivation from their language. But, to most of the audience, all they saw were the subtitles in English. To prepare for integration into China, the hospital gave Mandarin lessons to the staff. Bad Dad knew they were learning some language, but didn't know which language or why. They were learning Mandarin because almost none of the hospital staff knew Mandarin. I think that point went right over the heads of most of the audience. I understand a little bit of Taiwanese, Mandarin and Shanhainese, and I can distinguish the sounds of Japanese and Cantonese, though I can't understand them. It made it so much easier for me to keep the characters straight. If Bad Dad was lost, I think the rest of the audience must have been completely clueless. Was it really that bad? Actually, it was worse. They had to downplay the genocide to get it past the censors. My parents speak Taiwanese, Hakka**, Mandarin, Japanese and English. They also know a little bit of Cantonese. Like many American immigrant families, my parents will speak to me in one language and I will reply in English. Bad Dad's family spoke German at home and the kids replied in a mixture of German and English, too. I took enough German in high school and college to follow along and reply when necessary at my in-laws' house. Once, when we were visiting my dad and stepmom (who spoke Japanese when alone but spoke in Mandarin out of respect for my presence), Bad Dad didn't answer a question addressed to him. I poked him and glared. Why was he so rude? He gave me a, "What?" look back. No one else had realized that my stemmom had asked him a question in Mandarin and he didn't understand it! Q. What do you call a person who speaks three languages? * I have no idea why the movie background sheet distinguishes between Mandarin and Shanghainese. I had previously thought that the Shanghai accent was the adopted Mandarin standard pronunciation (used by TV and radio newsreaders, natives of Shanghai, and social pretenders). But I forgot that there are so many regional accents and dialects. I guess, at one time, Shanghai must have had a distinct dialect. It was before my time. ** The Taiwanese and the Hakka were the two most populous groups in Taiwan until the mid 19th century. Remember the sleeve I showed you in Proof that the right hand doesn't know what the left hand is doing? That was a sleeve-sized swatch. That was a .very. .bad. .idea. In a saddle-shouldered sweater, the sleeve's saddle extension is the keystone to the entire sweater. The keystone is cut last, to match the dimensions of the arch. Knitting is not like stone-cutting. That is, the measurements are mutable, especially when knitting with cables. Here are the two side fronts. One has been steam-blocked, the other hasn't. See the difference in size? If you didn't know the blocked dimensions, you would have thought that the sleeves needed to be longer and wider to form a 58.5" wingspan (the tip of one sleeve to the tip of the other sleeve). Why didn't I read Ravelry before I started the sweater? The sweater schematic measurements are off. The sleeve, made according to the directions, is too large for the armscythe. The sleeves are huge batwings. Anyway, the sleeve/swatch has been frogged back to row 28 (of 120) after the ribbing. Today, I reknit it up to row 80. Thankfully, the new sleeve will be only 108 rows before I cast off the edges to form the saddle. If you knit this sweater, I recommend knitting, blocking and measuring a swatch first. If you are short of yarn, as I was, knit a side front first. Fortunately, with the new slimmer and shorter sleeve, I will have enough yarn. I had bought 15 balls, when I thought I needed 14. Now I know why the old adage says to buy 10% extra instead of 1 ball extra. I went back to the Slipt Stitch to buy another ball, but Patricia was sold out of this color. Actually, she had bought Merinos Otto Shadow in 4 of the 6 available colors and sold out on 3 of them. I am not surprised. It is a gorgeous yarn and she sells it for a very competitive price, about 30% less than other stores in the South Bay and almost as low as the lowest internet price. For a brick and mortar store with personal service, she has good to amazing prices on quality yarns. Can you imagine day after day of cleaning up after this? I think that is why I read the Amelia Peabody series. I like how she palms off her "catastrophically precocious" son, Ramses, on any servant that she can find. And she has zero guilt about it. Seriously, I used to spend most of my non-working waking hours cleaning up after two able-bodied people. As soon as they walked in the door, my whole day's work went up in flames. That is not a fulfilling way to spend my life. Don't tell me it's my fault for not training them. I tried. I really tried. Amelia Peabody states that training Ramses is impossible. That's why I love her. Still life with flower and produce. Recipes for the green beans and cucumbers are at the Madison CSA blog. I asked a grad school buddy why he had a piece of theater scrim hanging on his living room wall. He told me the story of how he came to own the scrim. He'd gone to a play that his friends had put on. He hated it. When they asked how he liked the play, he remembered his mother's lesson. "If you don't have anything nice to say, don't say it." So, he changed the subject. And they pressed him again. They kept pressing him about the play. He kept raving about the scenery. Eventually, the story got back to the set designer, who gave him the backdrop scrim after the play closed. Bad Dad and I went to see August, Osage County tonight. I really liked the set and costumes. The casting was brilliant. The sister who lived in Boulder, CO was the tallest and thinnest of them all. I've started the Madison School CSA blog for all things related to the CSA (Community Supported Agriculture) program. Visit there to learn the latest news about the program. Beginning September 24, Tanaka Farms will deliver every Thursday to Neighborhood Grinds. Email madisonschoolcsa@gmail.com for an electronic sign-up form. Return the completed form with your check made out to "Madison PTA" for $25 per box to the Madison School Office (if you have children at Madison) or to Neighborhood Grinds (if you don't). Or, you can come by my office at work. To start, we will use rolling deadlines. You must turn in the order form and check on or before Friday in order to receive a box the following Thursday. After the start-up wrinkles have been ironed out, we will move to monthly order forms. Penny Richards, aka Pennamite, has joined me as co-blogger at Madison School CSA.We are both very enthusiastic about the new endeavor. Of course, we will provide recipe support. But, we will also use our backgrounds in geography, history, science, art and education to share our love of good food. Visit now to see sample CSA boxes and Food in Art. You know how the cavalry rides in at the end of the movie and save the day? Well, Bad Dad strolled in before midnight last Saturday night. Bad mom that I am, Iris was still awake. Hallelujah, my ten days and nights as single mom (with a cold and a child with a cold) and struggling to keep up with an avalanche of work at my market job were over! Bad dad came in, relieved that his ten days and nights of working the graveyard shift at his field experiment were over. He had a huge cumulative sleep deficit and wanted nothing more than to sleep, eat and then sleep some more. Our house and garden are a disaster area. There will be no pictures. I did manage to foist Iris off on some other families so that I could zoom off to UCLA's Fowler museum to listen to Beatrice Hohenegger's overview about the exhibit, Steeped in History: The Art of Tea. I learned some interesting tidbits, which I would like to share in post later. I also bought her book so I could learn more. I must bring Iris to see the exhibit. It runs until November 29, 2009. But, first, I need to take her to see Pompeii and the Roman Villa: Art and Culture around the Bay of Naples at LACMA. That is another well-curated show that I don't want her to miss. The Green Case for Cities: Forget the solar panels and the rain barrels—if you want to save energy, leave the suburbs. Bring back the bike shed: Let kids ride their bikes to school! Iris spent the day swimming and playing with a neighbor and old friend from daycare and Montessori school. This gave me three blissful hours on my own this morning. In the afternoon, I told his parents that the two kids could play at my house until my Genius Bar appointment at the Apple Store in Manhattan Beach. When I gave the 5 minute warning to collect their stuff and head to the door, they groaned in unison, "But we were just about to begin our knife fight!" I stayed perfectly calm. You see, she has several plastic knives in her play kitchen and make-believe box. It's hard to get upset at pastel pink and purple plastic knives. Nevertheless, I declared the playdate over.